Dr. Arnaud Martin and a team of scientists have found a "painting gene" that influences the pattern and evolution of butterfly wings. WASHINGTON (Sept. 18, 2017)— An international team of scientists have made a breakthrough in understanding how genetics and evolution work in concert to shape biodiversity by investigating the complex color patterns of butterfly wings. 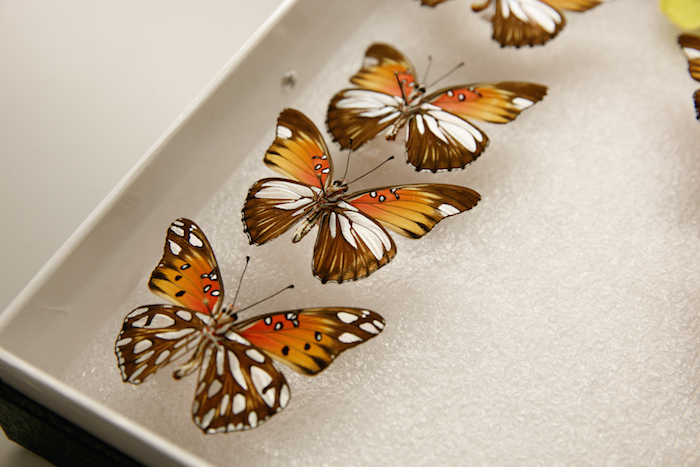 Dr. Arnaud Martin, an assistant professor of biology in the George Washington University’s Columbian College of Arts and Sciences, used CRISPR gene-editing technology to study the role of the WntA gene in formation of shapes and colors on butterfly wings—and how they diversify. While Dr. Martin’s work focuses on butterfly diversity, this branch of genetic research has major implications for studying all types of organisms—including humans. The study included researchers from Cornell University, the University of Chicago, University of California, Berkeley, Cambridge University, Oxford Brookes University and the Smithsonian Tropical Research Institute.